The tech world was rocked on Monday night ( 19 ) by a billion dollar transaction : Facebook announced the purchase of WhatsApp for no less than $ 19 billion . Of this amount , $ 4 billion will be paid in cash , $ 12 billion in Facebook shares and another $ 3 billion in restricted shares will be divided among employees WhatsApp over the next four years . The values ​​are high even for the technology industry , accustomed to bulky amounts . Purchases by Lenovo and Motorola Nokia by Microsoft , together totaling $ 10.09 billion . Marvel was sold to Disney for $ 4 billion . In a hypothetical scenario , if Facebook wanted to play all the costs of the World Cup in Brazil - until now budgeted at U.S. $ 33 billion ( equivalent to U.S. $ 13.8 billion ) - could do so peacefully and still have at least another $ 5 billion. Facebook is now the most popular social network on the planet with more than 1 billion users . Near that number , WhatsApp does ugly: are 450 million active users - representing about 37 % of the audience size of the social network . More than that , WhatsApp is present in virtually all operating systems : Android , iOS , Windows Phone , BlackBerry , Symbian and Asha line , Nokia. According to information from the website Business Insider , 41 % of Android users , the operating system that accounts for 82 % of the smartphone market , count on the active WhatsApp on their phones . On the other hand, Facebook Messenger , though popular tool is far from achieving such success . Taking into account only the Android , only 16% of users have Messenger installed and use the app frequently. In other words, if some tool could threaten the absolute dominance of Facebook in regards to communication tools , this company was not Google or Microsoft, but the WhatsApp messenger . What changes for the consumer ? As soon as the announcement of the purchase was disclosed in the technology websites , many users questioned about the direction that the Messenger and WhatsApp services should take . Inclusion of publicity and a possible integration between the two messengers are among the biggest fears and expectations of consumers . However , according to statements of Mark Zuckerberg , Facebook CEO and Brian Acton , cofounder of WhatsApp in principle nothing should change . " WhatsApp will continue to operate independently . The product strategy remains unchanged and the entire staff of the tool will continue in Mountain View , "said Zuckerberg .
" Here is a list of things that will change for our users after purchase by Facebook : nothing," Acton said in a statement published on the blog of WhatsApp . "You may continue using WhatsApp for U.S. $ 1 per year - as it happens - and all other tools remain unchanged ," he added . If we analyze what happened after the purchase of Instagram - to complete two years in the month of April - it is possible to imagine that the words of the leaders of the two companies are even true . Since then , the improvements gained Instagram , as the ability to post videos , and was also available for Windows Phone . Functioning as promised , remained independent of the social network . WhatsApp was created in 2009 by American Brian Acton and the Ukrainian Jan Koum , who currently holds the position of CEO. Both were employees of Yahoo! and ended up leaving the company to take care of their own projects . The idea for the app came about when the gym that Jan Koum attended decided to ban the use of cellphones. He was bothered by the lost while playing sports and as an engineer, decided to find a solution to the problem links. At the time the iPhone was the leading handset in the market and he bet that the concept revenge and soon all phones would become smartphones . In an interview , Koum said he hated the commercials that invaded the messengers and wanted her to stay away from that service .
" When you receive a message from the person you love, your family or your best friend , you must be able to respond immediately and can not be distracted by any advertising ," he said in an interview with Fast Company . " Smartphones are usually so small , so personal to put ads on that small screen does not seem right ," he added . His disinterest in adverts is already long date from the time that still worked at Yahoo! as Vice President of Engineering . In an interview to the site in 2011 GigaOm , Koum and Acton described themselves as " people -focused , quiet and worried about making a product that works well ." 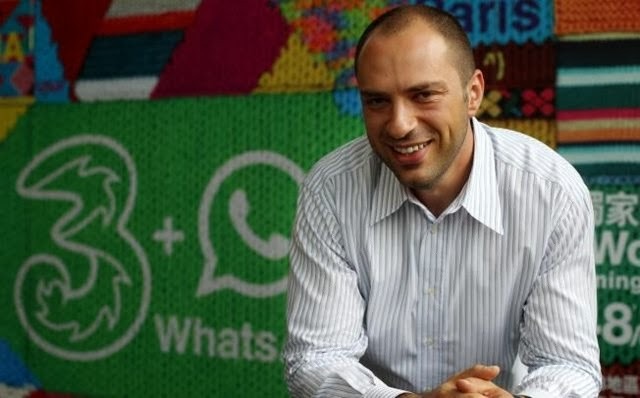 The Koum had a brilliant career ahead of WhatsApp, Acton Also has an impressive resume. As a programmer, he worked at Rockwell Engineering and later at Apple. Among the languages ​​you use que, are C, C + +, Perl, PHP, Erlang, Java and Python. 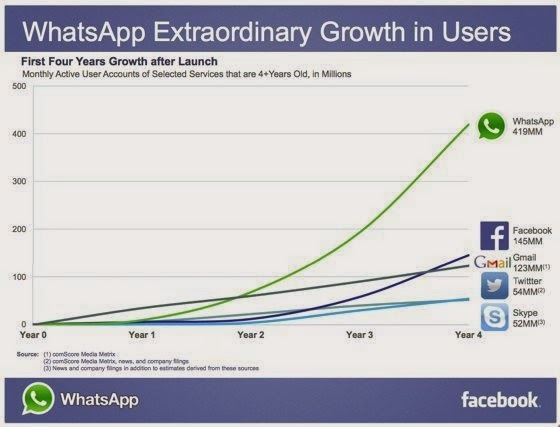 The success of WhatsApp does not seem to have changed very simple way of double. In 2012, after a visit to the headquarters of the press service, journalists Reported that Koum received visitors while barefoot Acton wore slippers. Trivia aside, the fact is que together They created the company in 2011 that alone, and worth little more than $ 8 million. 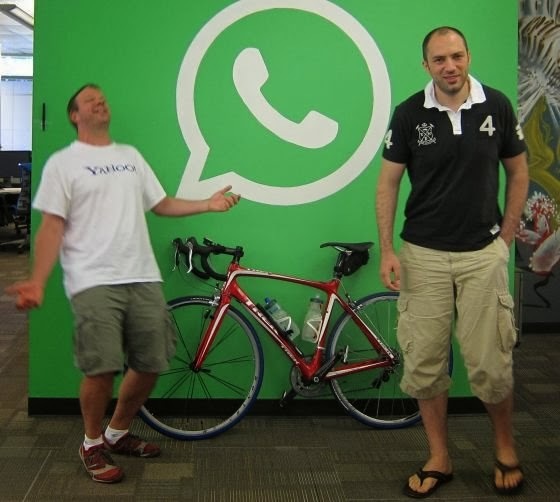 To reach the mark of $ 19 billion, it is Likely that They have hit a new record: WhatsApp is possibly the startup that had a more rapid appreciation of the history of Silicon Valley.